Instead of converting PAL DVDs to NTSC DVDs, this guide will show you how to free rip PAL DVDs (incl. European DVDs) to common file formats, like MP4, MOV, WMV, FLV, etc. Thus, you can play the PAL DVDs on any computer and popular devices iPhone, iPad, Android Google New Nexus 7, Samsung Galaxy, WP8, Xbox, and more. Read on to see how to rip PAL DVDs at zero cost, like James Bond film DVD, Beauty and the Beast DVD. PAL, the short form of Phase Alternating Line, is a color encoding system for analogue television used in broadcast television systems. It uses a frame rate of 25 fps and 720x576 aspect ratio. PAL is mainly used in most of Europe, Australia, Africa and Asia. Another main color encoding system is NTSC with a frame rate of 30 fps and 720x480 aspect ratio. And NTSC is adopted in North America, Japan and South Korea. PAL and NTSC are incompatible. Generally speaking, NTSC DVD players cannot decode and play PAL DVDs and vice versa. If you buy a movie DVD in Europe, how can you play it on a NTSC DVD player? Converting PAL DVDs to NTSC DVDs is the only way? Of course not. The solution below is highly recommended because it can easily free rip PAL DVDs to mainstream formats. It is economical because you don't need to buy blank DVD discs. It is an energy-efficient option, because it saves you from having to swap discs. You can play PAL DVD video on any devices whenever and wherever possible after ripping. If you're in America, you can also rip and convert DVD from Europe, such as Germany. So, what is the best DVD ripper that can free rip any PAL DVD, be it regular or encrypted? You may also be interested in NTSC vs. PAL. When you google "free DVD ripper", you will get innumerable results, including free DVD ripper, DVD ripper shareware and some DVD ripping tutorials. Needless to say, it is a real job to test DVD ripper one by one and pick out a proper one to free rip your PAL DVDs. Fortunately, the best free DVD ripper for PAL DVD ripping has been screened out in this article. That is WinX DVD Ripper. 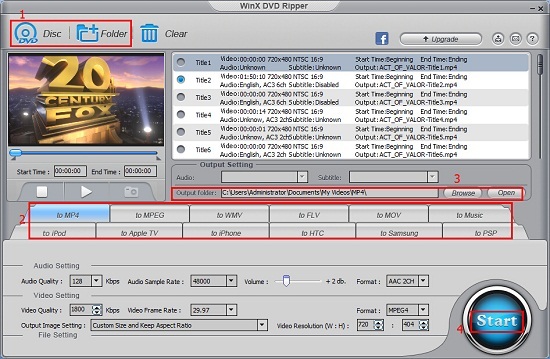 WinX DVD Ripper is a free yet professional DVD ripper for Windows 10 and lower, which is adept at free ripping PAL DVD and NTSC DVD to common file formats, MP4, MOV, WMV, FLV, just to name a few. Thanks to tons of device profiles, users can straightforwardly rip DVDs to Apple, Android, Sony, and other popular devices supported file formats. It can easily bypass copy and region protections and deliver video with lossless quality at ultrafast ripping speed, owing to advanced decryption technology, Super Encode Engine and Hyper-threading technology. How to Free Rip PAL DVDs on Windows (10/8/7) and Mac? There're only four simple steps to perform PAL DVD ripping by using WinX DVD Ripper Platinum. You are not required to set output profiles or adjust complicated parameters. Just a few mouse clicks. After downloading and installing this free PAL DVD ripper, you can begin ripping by following this tutorial. To free ripping DVD on Mac, please turn to DVD Ripper Mac Free Edition. Step 1. Click "DVD Disc" to load the PAL DVD that is ready for ripping. Step 2. Choose output profile for your PAL DVD. Tons of profiles are ready for you, including PC and Mac supported formats MP4, MOV, device profile for Apple, Samsung, HTC, PSP, and music profile, etc. Step 3. Specify a destination folder to store the video content free ripped from PAL DVD. Step 4. Hit "Start" to begin free converting PAL DVD. As you can see, free ripping PAL DVD to mainstream file formats by WinX DVD Ripper is easy to implement, even for non-professionals. Advanced version WinX DVD Ripper Platinum is particularly worth mentioning here. It is able to rip any PAL DVD and NTSC DVD, even the latest commercial movie DVDs encrypted by Disney DRM copy protections, like Frozen, Muppets Most Wanted, Maleficent. Moreover, compared with WinX DVD Ripper, the platinum version offers a wider range of ouput file formats covering almost all PC/Mac general profile, device profile, web video profile, TS video profile, music profile as well as DVD backup profile. Built in more advanced technologies, it can deliver ideal video audio effect at faster ripping speed. Dozens of DVD copy protections have emerged, such as Content Scramble System (CSS), Region Code Enhanced (RCE), User Operation Prohibition (UOP), Sony ARccOS DVD protection, the Analog Protection System, etc. Here's a guide of how to change the DVD format from PAL to NTSC with HandBrake for later burning a disc playable on NTSC player.